WHICH METHODS DO WOMEN USE? Contraceptive failure rates are defined as the percentage of users who will become pregnant within the first 12 months of initiating use. Perfect-use failure rates apply to those who use a method consistently and correctly. Typical-use failure rates take into account inconsistent and incorrect use by some users. 1. Daniels K et al., Current contraceptive use and variation by selected characteristics among women aged 15–44: United States, 2011–2013, National Health Statistics Reports, 2015, No. 86, https://www.cdc.gov/nchs/data/nhsr/nhsr086.pdf. 2. Jones J, Mosher W and Daniels K, Current contraceptive use in the United States, 2006–2010, and changes in patterns of use since 1995, National Health Statistics Reports, 2012, No. 60, https://www.cdc.gov/nchs/data/nhsr/nhsr060.pdf. 3. Hatcher RA et al., eds., Contraceptive Technology, 20th revised ed., New York: Ardent Media, 2011. 4. Sonfield A, Hasstedt K and Gold RB, Moving Forward: Family Planning in the Era of Health Reform, New York: Guttmacher Institute, 2014, https://www.guttmacher.org/report/moving-forward-family-planning-era-health-reform. 6. Kavanaugh ML and Jerman J, Contraceptive method use in the United States: trends and characteristics between 2008 and 2014, Contraception, 2018, 97(1):14–21, doi:j.contraception.2017.10.003. 7. 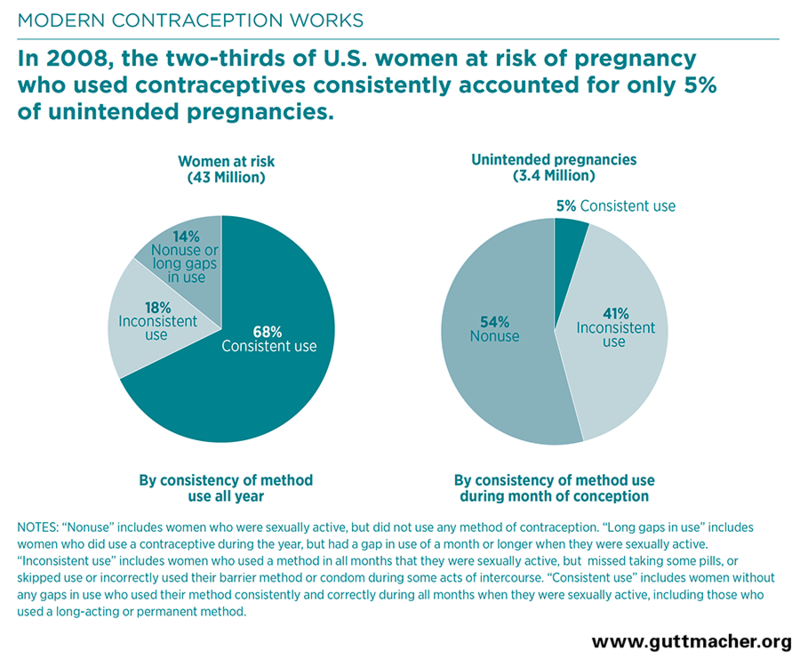 Jones RK and Dreweke J, Countering Conventional Wisdom: New Evidence on Religion and Contraceptive Use, New York: Guttmacher Institute, 2011, https://www.guttmacher.org/report/countering-conventional-wisdom-new-evidence-religion-and-contraceptive-use. 8. Daniels K, Daugherty JD and Jones J, Current contraceptive status among women aged 15–44: United States, 2011–2013, NCHS Data Brief, Hyattsville, MD: National Center for Health Statistics (NCHS), 2014, No. 173, https://www.cdc.gov/nchs/data/databriefs/db173.pdf. 9. Mosher WD and Jones J, Use of contraception in the United States: 1982–2008, Vital and Health Statistics, Hyattsville, MD, 2010, Series 23, No. 29, https://www.cdc.gov/nchs/data/series/sr_23/sr23_029.pdf. 10. Kavanaugh ML, Jerman J and Finer LB, Changes in use of long-acting reversible contraceptive methods among U.S. women, 2009–2012, Obstetrics & Gynecology, 2015, 126(5):917–927, doi:10.1097/AOG.0000000000001094. 11. Finer LB, Jerman J and Kavanaugh ML, Changes in use of long-acting contraceptive methods in the United States, 2007–2009, Fertility and Sterility, 2012, 98(4):893–897, doi:10.1016/j.fertnstert.2012.06.027. 12. Sonfield A, Why family planning policy and practice must guarantee a true choice of contraceptive methods, Guttmacher Policy Review, 2017, 20:103–107. 13. Sharma V et al., Vasectomy demographics and postvasectomy desire for future children: results from a contemporary national survey, Fertility and Sterility, 2013, 99(7):1880–1885, doi:10.1016/j.fertnstert.2013.02.032. 14. Martinez G, Copen CE and Abma JC, Teenagers in the United States: sexual activity, contraceptive use, and childbearing, 2006–2010, Vital and Health Statistics, 2011, Series 23, No. 31, https://www.cdc.gov/nchs/data/series/sr_23/sr23_031.pdf. 15. Special tabulations of data from Daniels K et al., Current contraceptive use and variation by selected characteristics among women aged 15–44: United States, 2011–2013, National Health Statistics Reports, 2015, No. 86, 2015. 16. Lindberg L, Santelli J and Desai S, Understanding the decline in adolescent fertility in the United States, 2007–2012, Journal of Adolescent Health, 2016, 59(5):577–583, doi:10.1016/j.jadohealth.2016.06.024. 17. Sundaram A et al., Contraceptive failure in the United States: estimates from the 2006–2010 National Survey of Family Growth, Perspectives on Sexual and Reproductive Health, 2017, 49(1):7–16, doi:10.1363/psrh.12017. 18. Guttmacher Institute, Testimony of Guttmacher Institute Submitted to the Committee on Preventive Services for Women, Institute of Medicine, January 12, 2011, 2011, https://www.guttmacher.org/sites/default/files/pdfs/pubs/CPSW-testimony.pdf. 19. Kost K and Lindberg L, Pregnancy intentions, maternal behaviors, and infant health: investigating relationships with new measures and propensity score analysis, Demography, 2015, 52(1):83–111, doi:10.1007/s13524-014-0359-9. 20. Sonfield A et al., The Social and Economic Benefits of Women’s Ability to Determine Whether and When to Have Children, New York: Guttmacher Institute, 2013, https://www.guttmacher.org/report/social-and-economic-benefits-womens-ability-determine-whether-and-when-have-children. 21. Bearak JM and Jones RK, Did contraceptive use patterns change after the Affordable Care Act? A descriptive analysis, Women’s Health Issues, 2017, 27(3):316–321, doi:10.1016/j.whi.2017.01.006. 22. Trussell J, Raymond EG and Cleland K, Emergency contraception: a last chance to prevent unintended pregnancy, Contemporary Readings in Law & Social Justice, 2014, 6(2), https://www.ceeol.com/content-files/document-124303.pdf. 24. Frost JJ, Frohwirth LF and Zolna MR, Contraceptive Needs and Services, 2014 Update, New York: Guttmacher Institute, 2016, https://www.guttmacher.org/report/contraceptive-needs-and-services-2014-update. 25. Frost JJ et al., Return on investment: a fuller assessment of the benefits and cost savings of the US publicly funded family planning program, Milbank Quarterly, 2014, 92(4):696–749, doi:10.1111/1468-0009.12080. 26. Health Resources and Services Administration, U.S. Department of Health and Human Services, Women’s preventive services guidelines, 2016, https://www.hrsa.gov/womens-guidelines-2016/index.html. 27. 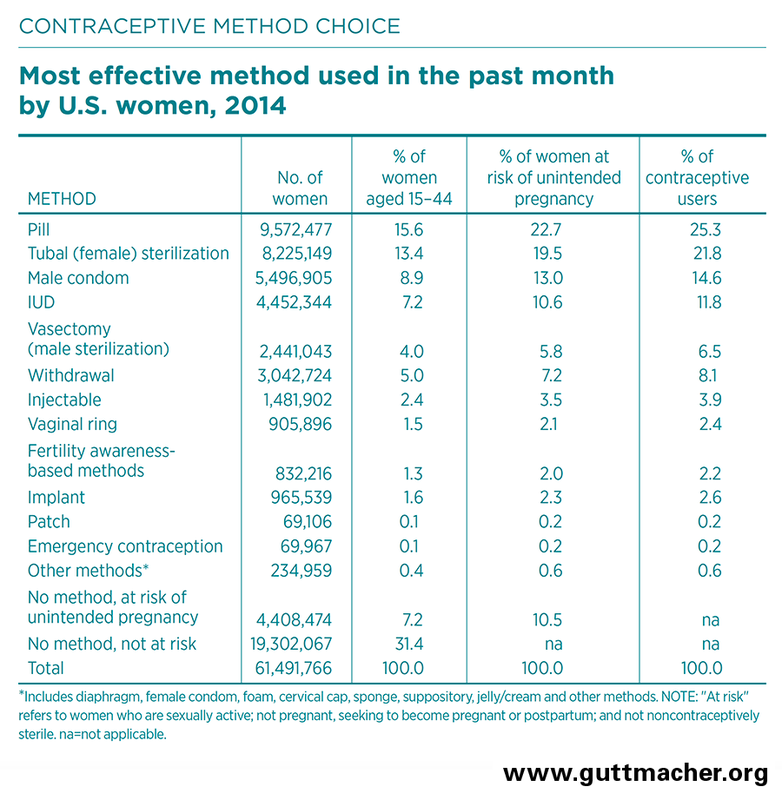 Guttmacher Institute, Insurance coverage of contraceptives, State Laws and Policies, New York: Guttmacher Institute, 2018, https://www.guttmacher.org/state-policy/explore/insurance-coverage-contraceptives. Kavanaugh ML and Jerman J, Contraceptive method use in the United States: trends and characteristics between 2008 and 2014, Contraception, 2018, 97(1):14–21, doi:j.contraception.2017.10.003. Sonfield A, Hasstedt K and Gold RB, Moving Forward: Family Planning in the Era of Health Reform, New York: Guttmacher Institute, 2014, https://www.guttmacher.org/report/moving-forward-family-planning-era-health-reform. 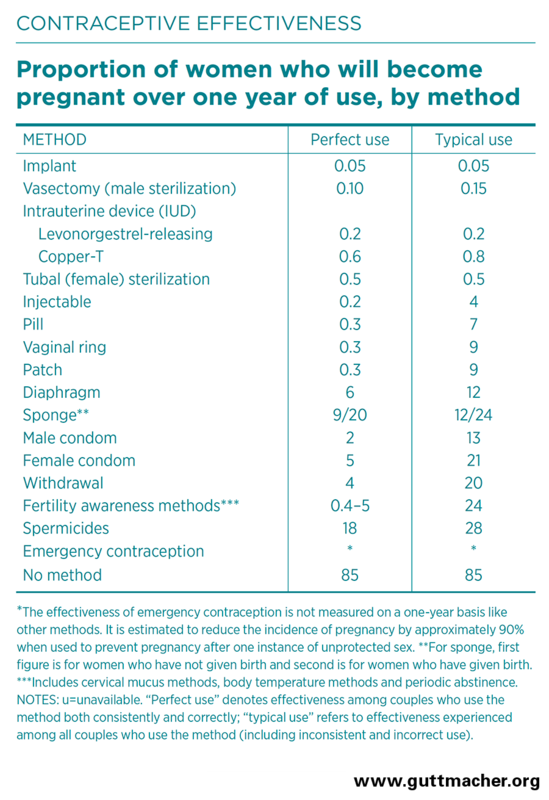 Source (perfect use): Hatcher RA et al., eds., Contraceptive Technology, 20th revised ed., New York: Ardent Media, 2011. Source (typical use except for injectable, pill, male condom and withdrawal): Hatcher RA et al., eds., Contraceptive Technology, 20th revised ed., New York: Ardent Media, 2011. Source (typical use for injectable, pill, male condom and withdrawal): Sundaram A et al., Contraceptive failure in the United States: estimates from the 2006–2010 National Survey of Family Growth, Perspectives on Sexual and Reproductive Health, 2017, 49(1):7–16, doi:10.1363/psrh.12017.